Langtang Trek - Blue Mountain Travels and Tours (P.) Ltd.
Nepal is the country having countless trekking destination for trekkers who come in Nepal for trekking. 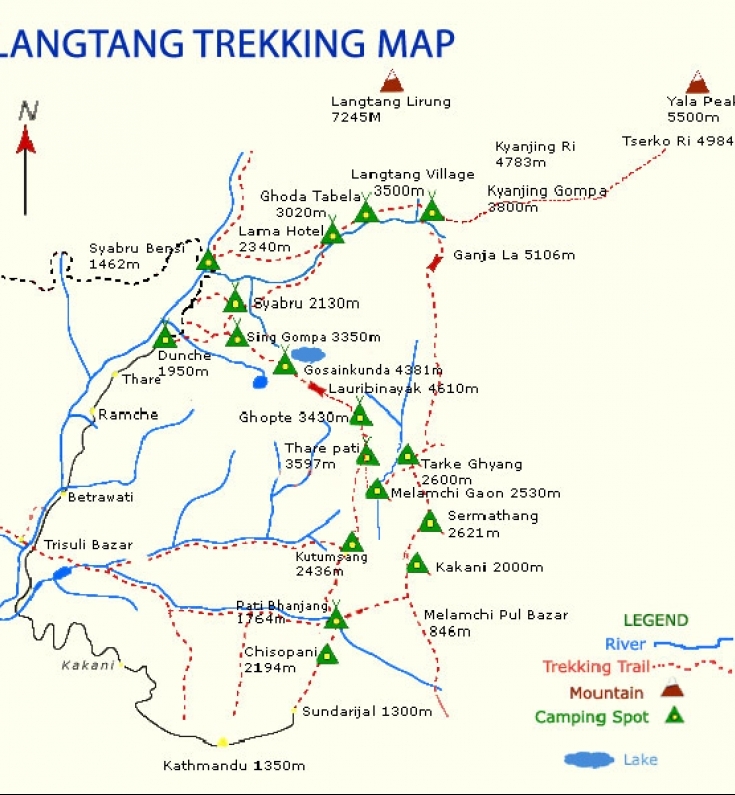 Among may trekking destination, Langtang Trek is one, close to the border of Tibet. 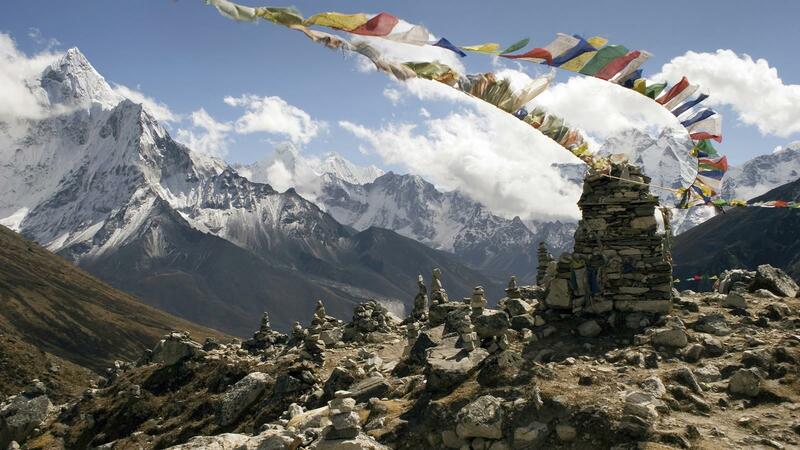 Langtang is originated from two words, ‘Lang’ means Yak and ‘Tang’ means to follow. The highest peak Langtang Lirung – 7,246m in the area dominates the narrow Langtang Valley which is situated on the lap of Langtang Himal, north of Kathmandu. 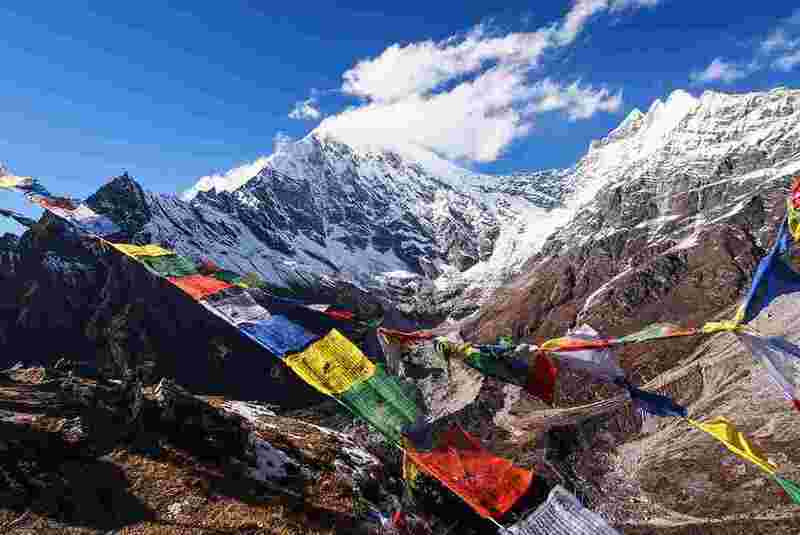 The Langtang trek to the base of Langtang Himal offers the shortest approach to snow-white mountains from Kathmandu. 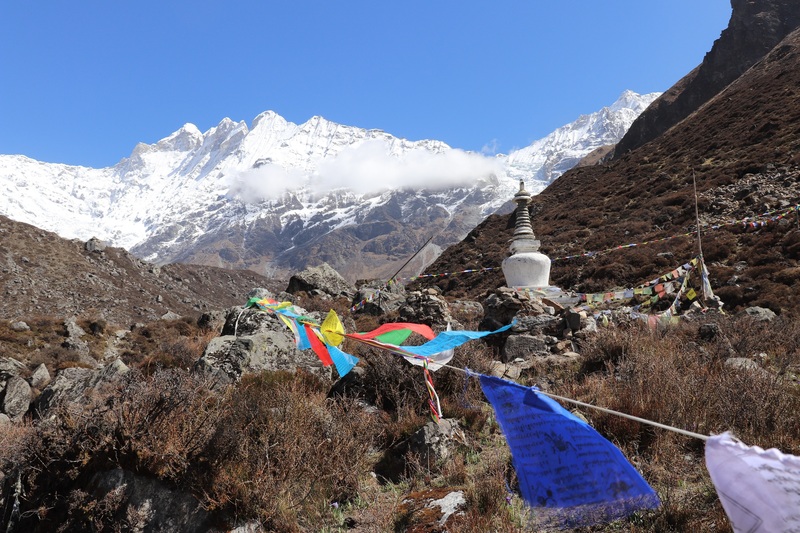 The Langtang Trek starts from Syabru Besi, passing through small peaks, green forests and wide spread Kyangin Valley surrounded by snow peaks. The glacier at a low elevation are amazing on the way towards the base of Langtang Himal. From the Kyanjin – 3800m one can have an opportunity to climb Kyangin Ri – 4500m. One can have breath taking 360 degree of mountain view from here. In this trek, the sacred Gosaikunda Lake is one of the main attractions. In August, full moon day, thousands of Hindu and Buddhist pilgrims visit the holly lake and take a bath there. Nepal’s first Himalayan National Park is the Langtang National Park is established in 1976, which now protected area is 1,710 sq. km. The park conserves the unique flora & fauna and wild animals. The parks is the habitat for Red Panda, Tiger, Wild boar, Musk Deer, Himalayan Black Bear, Himalayan Thar (wild goat). The best time to visit Langtang Trek is spring and autumn, but also can be done anytime of the year except July and August, the monsoon season in Nepal. Once you arrive at the Tribhuvan International Airport, Kathmandu, you will see Blue Mountain Travels and Tour’s representative waiting for you just outside the arrival deck. You will see a placard with your name printed on it. You will be taken to the trip hotel where you check in and relax for some time. Later, we will take you at Thamel, the main tourist hub in Kathmandu. Here will show you good restaurants, ATMs, money changer and other necessary places you might need to go. Than we talk about the trip in details. If your arrival is late today, we will do this tour and trip briefing tomorrow . Today after breakfast, we will take you for a heritage and historical tour of Kathmandu valley. A full day sightseeing in Kathmandu takes you to the amazing heritage sites of Pashupatinath and Boudhanath. Pashupatinath is a Hindu Temple considered as the most important Shiva temple in Nepal. The temple is open for Hindus only thus non-Hindu people have to stay outside the temple premises observing the Hindu death rites and rituals. We can encounter some Sadhus, the holy men, around who look so fascinating for photographs. The place is a rich spiritual and cultural source to have an insight on Nepali life and rituals. Boudhanath: It is considered as the biggest Buddhist Stupa in the world which lies in the middle of a beautiful square. The giant Buddhist shrine is a very important pilgrimage site for Tibetan Buddhist people. The stupa is considered to have been built in 4 centuries and carries some interesting stories behind its establishment. A stupa is basically a relic monument considered as a sacred shrine in Buddhism but there are several other types of stupas other than relic stupas. A stupa symbolizes the journey of a human being from material world to the world of enlightenment. Overnight at Hotel. Breakfast included. Driving the stretch of Kathmandu to Syabro Gaon or Syabrubensi on a scenic mountain road takes us around eight hours. On the way to the small and beautiful town of Syabrubensi, we can enjoy the rural beauty of Nepali town and villages.Once we reach Syabrubensi, we can go for some exploration of the town. Overnight at Lodge. Breakfast, Lunch & Dinner included. Today is the first day of exiting trek into the Langtang region. We are walking to Lama Hotel traversing the trail through beautiful local villages and amazing landscapes. The first day into the Langtang region brings us some wonderful views and nice fresh mountain air to breathe as we trace the trail on our footsteps. Once we reach Lama Hotel reaching the elevation of 2560 meters above sea level, we check into a mountain guest house(tea house). Overnight Guest House.All meals included. Today after finishing a breakfast, we start the trek for the day to enter Langtang valley. We are going to gain a good elevation today ,when we reach Langtang valley. The first part of the trek today is a gentle ascent and later it grows into tougher climb. Before we reach the destination today, we walk past lots of Buddhist Mani walls, Chhortens, villages, forested part to enjoy the nature, culture and spirituality to the most. Once we reach Langtang village, we check into a tea house and enjoy the relaxing and soothing air of the valley. Langtang valley was very badly hit by the earthquake and the facilities were swept away by landslides. But the region is declared as safe region to visit after several land surveys. A lot of rebuilding works were carried out in this region after the earthquake with high priority. Some new lodges have been established in slightly a different and safe location than the original location of the village. Overnight at Guest House.All meals included. Today we walk into the incredible Langtang valley starts after the mouthwatering mountain breakfast and advances towards Kyanjing village. The walk of the day takes us past beautiful mountain surrounding with amazing views and cultural, spiritual richness. The trail that winds up and down the beautiful mountain tests our endurance. we reach here by lunch and we have half day to explore around.We visit the amazing Kyanjing Gompa, a beautiful and sacred Buddhist monastery and can enjoy a breathtaking view of the Himalayas. We are going to achieve the highest elevation of the trip today when we go for an early morning hike to Kyanjing Ri. From Kyanjing Ri, we enjoy a magnificent panoramic view of the Himalayan peaks. After spending some wonderful moments at Kyanjing Ri, we hike back to Kyanjin Gumpa for Breakfast and all the way down to Lama Hotel today for our overnight stay. Overnight at Guest House. All meals included. After a few days of leisure time in the Lagntang valley and Kyanjing, we are trekking back down towards Syabru village. The trek takes us to a different route than we took to go towards Langtang valley a few days earlier. We are going to experience the a unique cultural life style of people living in the region and a wonderful natural setting of the amazing landscapes. Overnight at Syabru Village. All meals included. Today, we trek to Dhunche and completed our trekking. Dhunche is a small and beautiful town at the end of our trekking trip. Some trekkers start trekking to Langtang valley from Dhunche as well. Today’s trekking takes us through forest and natural wonders before reaching Dhunche. Overnight at lodge. All meals included. Another different perspective on the mountain road is on the way as we drive back to Kathmandu. We reach Kathmandu, check into hotel and find some free relaxing time. Overnight at hotel. All meals included. We will take you around the local town in Kathmandu to feel the local life and culture. You will have a great moment to enclose with the religious and cultural affluence to unveil the social and historical mysteries. Bustling city, to view the artistic Kathmandu Sightseeing Tour bequeaths you an opportunity to capture the snaps of the centuries old monuments and historical crafts in the Kathmandu city. We will take you walking around the local market Ason, the oldest and most busy & famous market in Kathamndu, supermarket Bishal Bazar, and many Temples and Stupas. We will take you to Kathmandu Durbar Square. It is famous for it’s unique history, cultural and religion and the living goddess Kumari lives here. Once there was a lots of small monuments and temples in this area. The whole square was listed in world heritage sites. But destroyed after the massive earth quake in April 2015. We will drop you to Tribhuvan International Airport for the departure flight there prior to your flight schedule. We are grateful to give you our services and hope to see you next year too. Thank you.